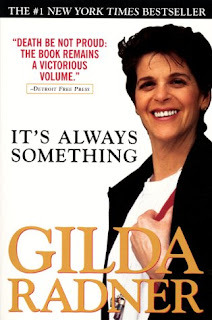 Found myself thinking today about one of my favorite comediennes, Gilda Radner. She's the author of the first quote here. Delicious ambiguity. What a great turn of a phrase. How did she come up with it? Turns out it’s a story worth telling. She met the love of her life, Gene Wilder after a lifetime of struggle. It was love at first sight. They fell quickly in love and got married. A year later she was diagnosed with Ovarian cancer. She wrote an autobiography during this period of her life. The title has always been embedded in my brain. In the end, I’m not sure there’s a better description of life. It’s always something. We spend so much time worrying and fretting and putting out fires, and in the end it’s all an exercise in futility. We never have complete peace in this life. Not really. As one flame is extinguished, another one begins to spark. So it goes. So what are our choices? Do we accept that life is a never ending series of struggles and surprises, and stoically plug away? Perhaps. But maybe there is another alternative. Maybe, just maybe, it isn't the end of the world. Perhaps it’s a question of perspective. What if, on a long enough timeline, all of our little worries and problems and conniptions are simply elements of a longer narrative that have yet to completely clarify themselves? I know from monitoring my own absurdity, that time does in fact heal things in the strangest of ways. It doesn’t take years either. Sometimes it can take hours or minutes, and, when we’re really attuned to our own emotional reactions, even seconds. How do we ever get to this place? Each one of us has stood, humbly in regret, and considered how our emotions have been hijacked in the wrong direction. Perhaps we said something awful that we couldn’t take back, or acted impulsively when we were hurt, or made a decision based on emotions rather than reason. We all do these things. All the time actually. We (I!) throw these minor temper tantrums in our heads all the time. Why do all the traffic lights turn red right when we get to the intersection? Why do the unexpected bills come right when we get a little ahead? What can you do but laugh at these things? As Captain Jack Sparrow says so eloquently in Pirates of the Caribbean “The problem is not the problem. The problem is your attitude about the problem.” Amen Captain Jack. So perhaps the takeaway from Mrs. Radner’s philosophy lies in her advice about “Delicious Ambiguity.” We never really know what direction our day is going to take. There are surprises everywhere, and some of them are good, many of them seem bad, and all of them come regardless of what we think we “deserve” out of life. Attitude is where we have our power, and, although we can’t often predict all of the plot twists, it does in fact allow us to chose if the little movie that is our life is going to be a tragedy or a comedy. The line is thinner than we often think. And now, I have to wrap this little essay up, and take care of a couple of things. My new white shirt has red wine on it, I’m out of clean underwear, and I’m pretty sure I left the lights on in my car last night. Any of these things would be enough to drive me crazy on most days, but for now I’m going to laugh, dig my way out of the mess I made for myself, and soldier on.